Having significantly disrupted the real estate market and transformed the way people find homes, NoBroker.com is set to upgrade security within housing societies. The world’s largest ‘peer-to-peer’ real estate portal has recently launched the NoBrokerHOOD app, a tech-enabled visitor and community management system which would make life more convenient and secure for residents of housing societies and townships starting with Bangalore, Mumbai and Gurgaon. NoBroker.com aims to onboard at least 1 lakh residential communities across India by 2020. The constant movement of service staff (maids, drivers, courier services, delivery personnel, etc.) and guests make security management a hassle. While most apartment buildings and residential complexes do have security measures in place, they are either outmoded or rely heavily on manual registration. Large societies render human staff inadequate for day to day tasks. Further, such inadequate management of visitor entry also leads to day-to-day challenges for residents, such as unauthorized visitor entries/vehicle parking and maintaining service staff attendance. Moreover, residents are required to respond to calls from the Gate to authorize entry which might be troublesome and difficult if people are in meetings. It is this need-gap that the NoBrokerHOOD app is addressing through its unique tech-led approach. 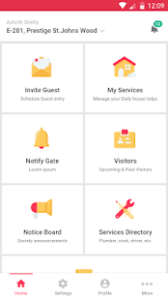 The platform offers a plethora of services and features which enable users to manage multiple activities inside residential buildings, housing societies, and gated communities, ranging from finding domestic help to monitoring visitor entry and pre-authorising guest visits with an OTP. It also further strengthens the safety aspect by keeping visual and digital records of all entries and exits – accessible anytime and anywhere – and automates staff entry through biometric processes. Housing societies such as Suncity (Bangalore), Aravali Heights (Gurgaon) and Oberoi Springs (Mumbai) have already onboarded the platform. The app is very simple to use and comes with even more simplified features for senior citizens who are not very tech savvy. The resident can pre-authorise a visitor through just an OTP. Or whenever a visitor arrives at the gate, the duty guard enters their details into the app and notifies the relevant resident. Residents receive a visitor notification on their registered devices and can either approve or reject the request. The duty guard receives the resident’s response and accordingly allows or denies entry to the visitor. Users can also give instructions to the security staff through an IVR calling system. The NoBrokerHOOD app can broadcast alerts and notifications to the entire society and allows residents to stay connected with each other through a Building Society Residents’ Directory. It also helps users choose service staff such as electricians, cooks, maids, plumbers etc. based on reviews from the society’s own yellow pages, as well as conduct Aadhaar-based verification of all service staff catering to the residents. It can additionally ensure digital and recorded authorization for the entry of all handymen and delivery boys to ensure better safety and prevent theft. NoBroker.com also provides extensive after-sales service for the NoBrokerHOOD app, giving solutions to users, even post-purchase. With the urban population in India expected to cross 600 million by 2030, the large-scale population influx from tier-2/3 cities and semi-urban geographies have put a lot of strain on the available real estate in major metropolitan centers. Managing this burgeoning housing demand has led to a rapid mushrooming of housing societies and high-rise apartment complexes. The security in most such societies, however, is usually outsourced to third-party service providers who are still using antiquated security approaches. The launch of the NoBrokerHOOD app is, therefore, being hailed as a much-needed and revolutionary tech intervention in the urban residential society space. By enabling extensive, end-to-end provision of features and support, the NoBrokerHOOD app can significantly streamline, optimize, and manage security operations, thus improving the quality of life for Indians through technology.